The Broadcast was the name initially given to the project that grew out of The Nuclear Family started by Justin Roelofs, Josh Berwanger and myself. It was decided early on that we needed a dedicated keyboard player, preferably a foxy girl with a great voice, and I knew just the one. Introductions were made and Adrianne Verhoeven, a high school classmate of mine, was in. She was classically trained as a singer, pianist and percussionist, but didn’t have any equipment. No problem: Josh had saved some money working at a video rental store and began acquiring gear. When he showed up to practice with a Moog Prodigy we knew this would be for real. Alex Brahl practiced with us a little bit on bass early on, but he was too busy with his own band, school, and recording other bands to make a solid commitment. He went on to have a hand in managing and producing records for a few bands on the Vagrant roster and later had an affiliation with Curb Appeal Records. We recorded an LP’s worth of material at his home studio. I’m pretty sure Justin played bass on all of it except one song and he and Josh played most, if not all, the keyboard parts. UPDATE 8/27/10: here are mp3s of seven of these nine songs! Will You Run Away With Me? It must have been May or June of 1997 when we successfully convinced Jim David to join the group. He was attending KU and a great bass player. We spent a lot of time in Josh’s parent’s basement rehearsing. I remember an angry white dog running around the house that Josh affectionally referred to as “it,” Johnny Depp posters and tons of plastic action figures. 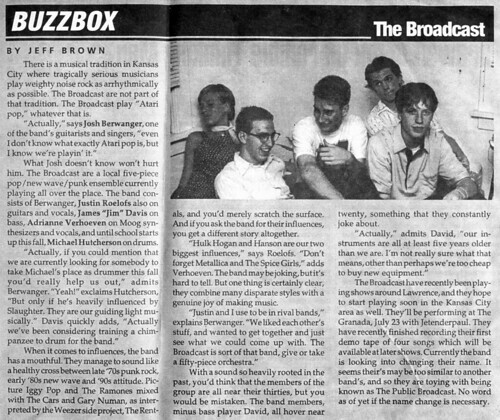 It was exciting to be doing something different, not only in the sense it was something new to all of us, but also that no one else was making music like it in KC. 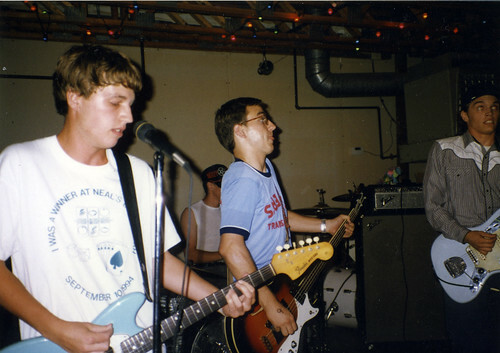 Here are a few photos from a show in Wichita, summer of 1997. I forget why, but Adrianne couldn’t make it, so we were Moog-less on this date. The Granada show mentioned here ended up being a good one. Looking back at that night, there was a harbinger of things to come that I doubt anyone else picked up on: Rob from the Get Up Kids seemed way too psyched on our band. That may have been one of the first times he and Adrianne met and anyone close to that scene knows what was to follow. 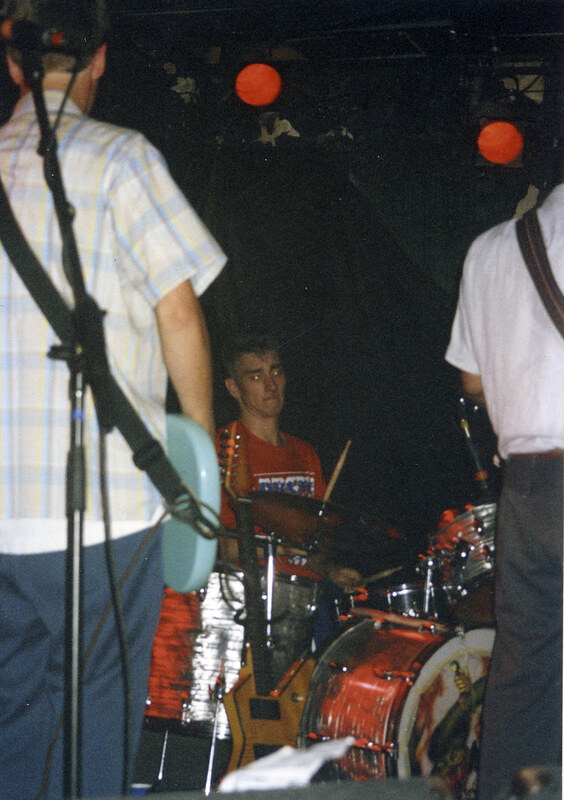 Shortly after I moved to Massachusetts the band name was changed to The Anniversary and Chris Jankowski stepped in on drums. 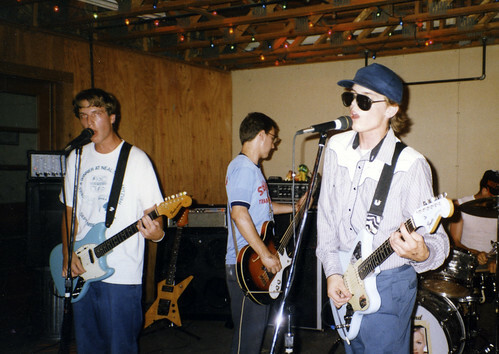 They went on to have a pretty good run, touring with Superchunk, The Get Up Kids, Apollo Sunshine, Dashboard Confessional and Hot Rod Circuit, and putting out a handful of LPs and singles before disbanding in 2004. I’d be lying if I said I didn’t feel a little weird those guys chose to effectively write me out of their history. If there ever was a missed opportunity to do what I love to do more than anything, it was probably this band.